Displaying image 189 of 200 images in Physics. In 1931, when Karl T. Compton became president of Massachusetts Institute of Technology, Van de Graaff was invited to come to MIT as a research associate. 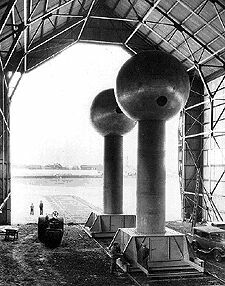 In 1931 Van de Graaff constructed his first large machine in an unused aircraft hangar at Round Hill, the estate of Colonel E.H.R. Green, in South Dartmouth, Massachusetts. The machine used two polished aluminum spheres, each 15 feet in diameter mounted on 25 foot high insulating columns, which were 6 feet in diameter. The columns were mounted on railway trucks that boosted the spheres to 43 feet above ground level. The machine had its debut on November 28, 1933 and was able to produce 7,000,000 volts. This accomplishment was reported in the New York Times for November 29, 1933 in a story titled "Man Hurls Bolt of 7,000,000 Volts". In 1937 the machine was moved to a pressurized enclosure at MIT.